Policemen in Amroha buy diyas from the children, urge other members of the public to come forward and help. 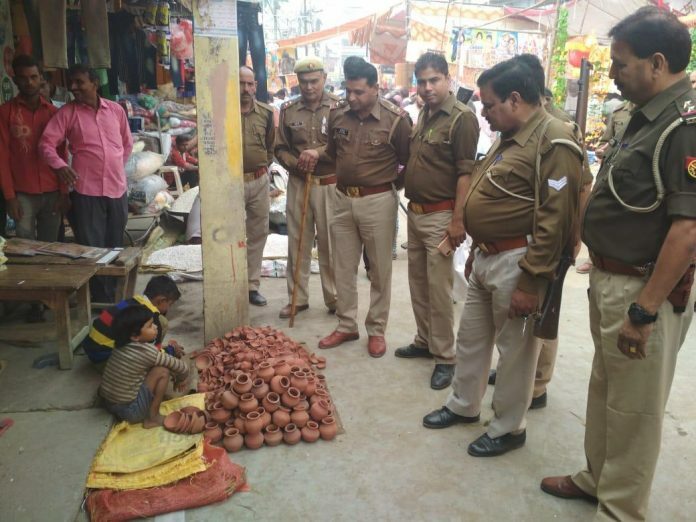 New Delhi: A photograph of seven Uttar Pradesh policeman surrounding two children selling diyas (lamps) has been widely shared on social media, with the story behind it a heart-warming tale that is in stark contrast to the force’s reputation of being a trigger-happy, law-flouting one. As it turned out, the policemen weren’t present to intimidate the children but to buy the diyas from them. The incident occurred at Amroha, in the north-western part of the state. The entourage was led by Amroha station house officer Neeraj Kumar and consisted of two sub-inspectors and four constables. The policemen say they were on the rounds of Amroha’s Nagli Baazar on the occasion of Dhanteras Monday, when they came across the children. “Initially they panicked. They thought we might ask them to remove their diyas,” said SHO Neeraj Kumar. “But all we wanted to do was help them. “Someone had forwarded me a video where this child went from market to market trying to sell diyas to make money for his mother. It’s all I could think of when I saw them,” he added. According to the SHO, the girl selling the diyas could not have over six years of age, and the boy around was 10. The children, he added, lived with their mother and maternal grandparents, since their father passed away, and were selling 150 lamps for Rs 100. “I came from a lower middle-class family. I know the value of small things that can light up a festival. I hope it made their Diwali a little happier,” Kumar said. The policemen say that they themselves spent Diwali together. “We were passing through the market when we decided to approach the stall,” said sub-inspector Chatarpal Singh, adding that by then, the children had sold very few lamps. “We thought we could set an example that if we bought some diyas, maybe the public would as well,” Singh said. And according to Singh, it did help as other people came forward to buy the lamps. This is a photo op. SEVEN policemen standing around an urchin selling some earthenware (I can’t see the diyas; they look like small earthen “matki”s). This photo looks so artificial. This is a silly image makeover exercise by UP police who gained bad press for shooting down an unarmed man in Lucknow (that APPLE executive, I’m sorry I forget his name.) And then REVOLTING against the government when action was taken against the shooter. A great effort. The society needs more of such persons and stories.